A prayer answered on a fridge. let thy name henceforth be ever on my lips. ever repeating thy sacred name, Mary, Mary. or even only think of thee. for my good, so sweet, so powerful, so lovely a name. Make what you want of the power of prayer. Upon arriving in Long Beach we looked for a place to live. We looked at 40 places in a week to no avail. To lessen the stress of the search we went to the thrift stores. I came across the Prayer to the Mother of Perpetual Help, read it and asked my wife if she wanted it for 50 cents — she's into religious iconography. She read it and said, yes. The next day we found the apartment of our dreams. One block from the beach. We both think the Prayer to the Mother of Perpetual Help had something to do with it. 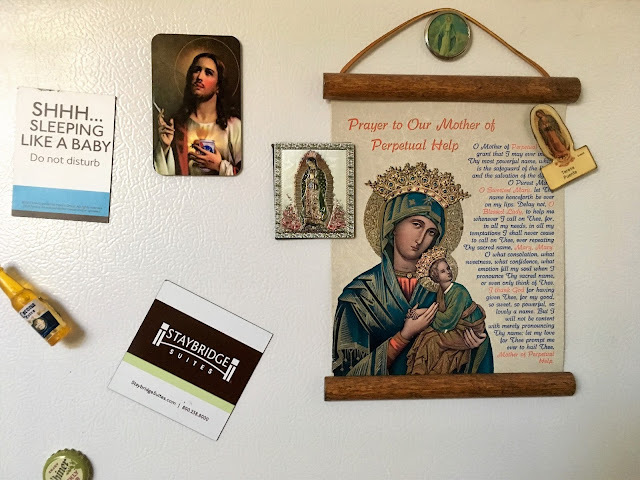 The prayer has found a permanent home on the side of the fridge.